New pond owners often inquire about the health and safety of their fish during the winter months. As long as your pond does not freeze to the bottom and an air hole is provided on the pond’s surface, your fish will survive the winter. If your pond is at least two-feet deep, the proximity of the earth to the pond’s surface will keep the pond from freezing any deeper than eight inches. That leaves 16” for the fish to lounge around and hibernate over the winter. 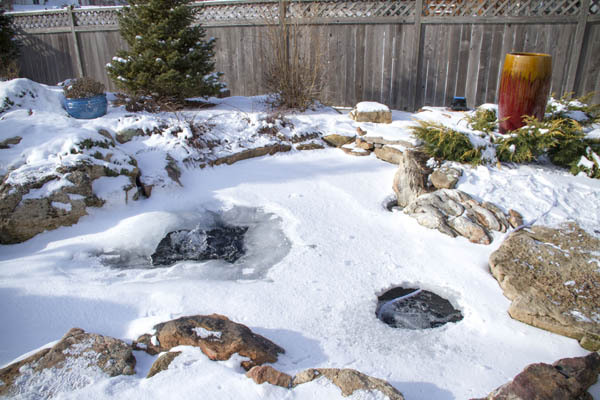 Use an Aquascape Pond De-Icer to maintain a hole in your pond’s ice and allow for the exchange of gasses (like oxygen). Supplemental oxygen can also be supplied by running your waterfalls, adding a pond aerator, or using a pond pump like the AquaForce to churn the water near the surface. Your pond fish will become dormant during the winter once water temperatures drop below 50 degrees F. This is also the point at which you should stop feeding them. The enzymes needed for the digestion of most koi food is lacking once the weather turns frosty. You don’t want your fish to eat and then languor in the cold water as their metabolism slogs the food through. In very cold water, fish simply don’t eat. Take care of your koi and pond fish during the winter months to ensure a healthy life for them well into spring and beyond.